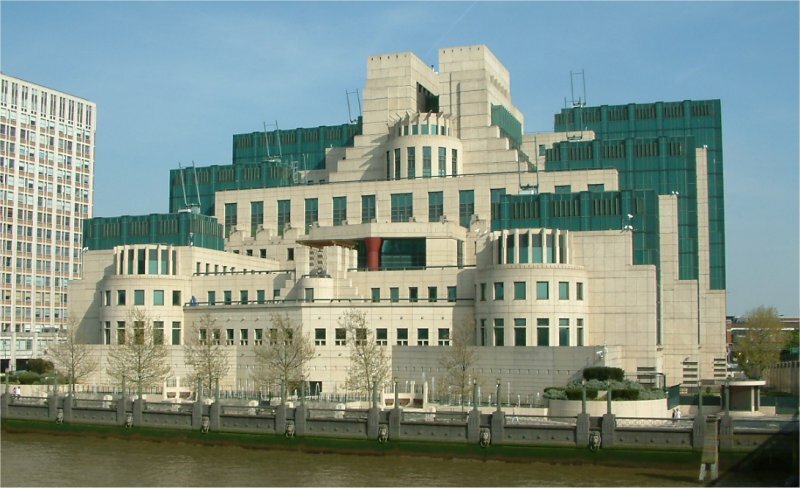 The headquarters of MI6 or the British Secret Intelligence Service have been, since 1995, located at 85 Vauxhall Cross, on the Albert Embankment near Vauxhall Bridge. This group of buildings was designed by Terry Farrell. On the evening of 20 September 2000, the building was attacked by the Real IRA using a Russian-built RPG-22 anti-tank missile. The missile caused superficial damage. In difficult conditions and under the attentive eyes of security services and a circling helicopter, a team from Thames Discovery Programme (TDP), has discovered London’s oldest structure on the foreshore of the Thames just metres from the MI6 building in Vauxhall. Details of one of the most significant ever foreshore finds have just been revealed in the latest issue of London Archaeologist, published today. As they surveyed the foreshore in spring of 2010, archaeologists from TDP found six timber piles of up to 0.3 metres in diameter. Although no definite alignment or function can yet be determined, it is clear that the piles formed part of a prehistoric structure which stood beside the river over 6000 years ago, during the Mesolithic period, when river levels were lower and the landscape very different. Structures of Mesolithic date are very rare anywhere in Britain. Kept secret until it could be fully recorded and investigated, the site is located at the confluence of the Rivers Effra and Thames. Near the timbers, late Mesolithic stone tools, including a fine tranchet adze (a woodworking tool), were also discovered, as well as slightly later Neolithic pottery of two distinct types. The area, may have been a significant, named place continuing through centuries or even millennia. It is only 600 m downstream from the Bronze Age timber-built bridge or jetty (c 1500 BC) which hit the headlines in the 1990s. Archaeologists from TDP made the discovery as they investigated the area as part of a continuing project to record archaeological and historical remains on the foreshore. With support from English Heritage, the Museum of London and the geomatics team of Museum of London Archaeology a detailed survey was carried out, radiocarbon dates obtained for the six piles [details in note 5], and specialist analysis of the artefacts and environmental evidence performed. The timbers are located very near the lowest tide level of the Thames. More evidence may be recovered in future since, like most of the astonishing remains that have been discovered on the foreshore – from huge collections of ships timbers to human burials to Saxon fish traps – the site is affected by the scour created by the twice-daily tides and the growing river traffic. The remains are also threatened by planned riverside developments, including the much needed Combined Sewer Overflow which will pass metres from the timbers. A major research project is underway. The fieldwork was supported by grants from the Heritage Lottery Fund and from the Southwark and Lambeth Archaeological Excavation Committee. For copies of London Archaeologist and the article, see note 1 below. Note: Radiocarbon dates taken from the timbers have indicated that the trees were felled between 4790 BC and 4490 BC. The three samples returned dates of 4792-4610 cal BC, 4690-4490 cal BC and 4720-4540 cal BC. 6. The Mesolithic period in Britain (from c 10,500 to c 6,000 years ago) was characterised by a growing population that was hunting and foraging in a changing landscape. As temperatures rose following the last ice age, so did sea levels, cutting off the land bridge to the European continent, and prompting social changes. Hunting and woodworking techniques and tools were modified to deal with different game populations and forestation.